I hope you are fit and well. The new season is almost upon us, it’s just a month away now. Stocks will be fully stocked and open for business at 8am on Saturday February 21st. We will stock 4000 rainbows about a week before the opening day. The trout will be introduced into Hollins Bay, Ben’s Beach, Grindy’s Lawn, The Alders, Halstead’s Hike and on either side of the of The Causeway so they will be well spread by the 21st. The trout are in fine fettle and we have plenty of 3lb+ fish. This year the specimens are particularly vigorous and fit. We have made some improvements to the Stocks website, I hope you will benefit from them over the course of the season. The reports page has a new format to include both fisheries and will feature regular short video clips of relevant information. The general content will be interviews with successful anglers, fishing techniques and tips, tackle reviews, seasonal entomology and trout spoonings, fly tying and more. Also check out the new hot spots map. I think you’ll agree it’s a lot better, it is currently showing the pre-season stocking points and likely hot spots. Have a look around the site, your comments would be welcome. I have updated the competition page on the website and it now shows all the match dates and final venues for the 2009 season. The first competition of the season is The Northern Bank Masters on March 1st. This should be a great match with plenty of fish to be caught, it will be pegged along a single stretch of shore line and competitors will rotate around the pegs. The next match is the Stocks Grey Pairs on March 15th. Greys are new sponsors of this match which was previously called Masterline Pairs. In this popular competition one angler in each pair will fish from the shore and the other from the boats. There are also some exciting new matches this season, amongst them there are three Stocks Sweep Stake matches that will have cash prizes and will be fished from the boats to international rules. You can see all the matches at http://www.stocksreservoir.com/competition/index.htm . I will add printable entry forms and further details on each competition shortly. Organised by a team headed by Charles Jardine this new match looks as though it is going to be the real deal. It will be a bank fishing competition fished to fishery rules flies and aimed to appeal to both new comers and seasoned anglers. There will be heats held around Britain and it is going to be highly publicised. It will be sponsored by Winner Web and will be called something like The Winner Web National Bank Championship. It will visit Stocks on Sunday May 17th. There is a prize fund of £14,000! I’ll keep you posted as I learn more. This entry was posted in Stocks Reservoir Fishing Reports on January 22, 2009 by Ben Dobson. 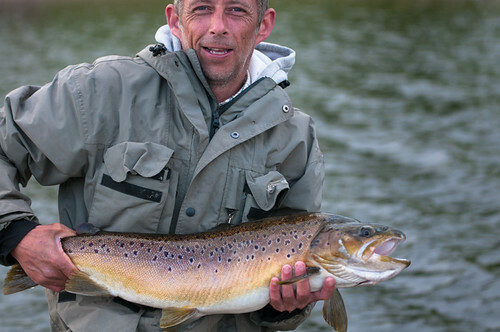 The best tactics at Bank House Fly Fishery at the moment depend upon the water clarity. If the water is very clear and then buzzers and nymphs will score well. In cold, frosty conditions the bung will probably out fish other methods but on the more mild days you will catch well just free ling them or fishing them on the washing line. If there is some colour in the water then brighter beaded flies are a better substitute for the nymphs or another method is black n green lures tweaked along the bottom on floating lines. I will be stocking some cracking specimens before the weekend so I wouldn’t recommend fishing less than 6lb tippet. Have a look at the new virtual tour on the bank house page. If it doesn’t open first time re-click the side link whilst the black pop up is being displayed. This entry was posted in Bank House Fishing Reports on January 22, 2009 by Ben Dobson. On the day…this will be a unique occasion for Trout & Salmon anglers in the North East region and from further a field to have the opportunity to view, try, and buy, in one location a massive selection of rods, reels, fly lines, fly tying materials & equipment, flies, hooks, tippet materials, sports clothing, etc, in anticipation of the new 2009 season. Also on the day there will be various casting, fly tying demonstrations along with the ever popular “Advice Squad” presentations on competition fishing, still water fishing, and much more. The 2009 show will see the introduction of a few Sea Angling stalls as the show is geographically located within the boundary of a large sea angling fraternity.